London December 12th 2012. AREVA announced today that it has signed memoranda of understanding (MOU) with 25 UK-based companies for the supply of components and services for new EPRTM nuclear reactors planned for the UK. These companies cover a wide range of products and services, including forgings, valves, pumps, cranes, electronics, piping, tanking and refrigeration units. Together with agreements already announced with Rolls-Royce, the scope of work could be worth up to four hundred million pounds to British industry. In all, AREVA has already identified 50 companies based in the UK with potential capability to meet the scope. Of these 50, the 25 companies who have signed MOUs are pre-qualified and for the other 25, AREVA is committed to start a prequalification process once it receives a firm order from EDF Energy. The Government backed Nuclear Advanced Manufacturing Research Centre has agreed to support all 50 UK companies, to pre-qualify, qualify and then bid for work. The agreements relate to the two EPRTM reactors planned by EDF Energy at Hinkley Point for which a site licence was granted last month. The collaboration could also extend to other EPRTM reactors including those planned at Sizewell. AREVA has furthermore taken additional actions to enlarge the number of suppliers beyond the 50 already identified at this stage. 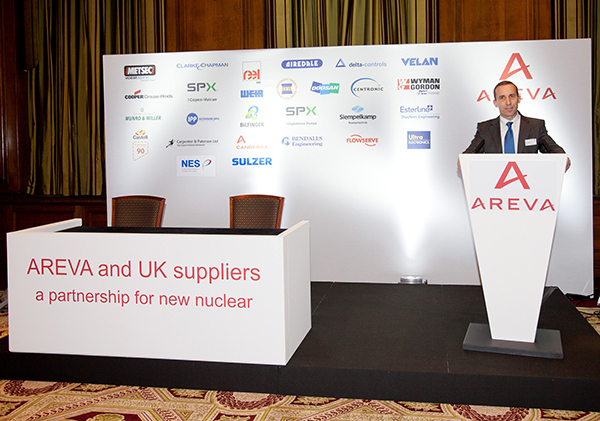 Announcing the agreements today, Philippe Knoche, AREVA’s Chief Operating Officer, said: “AREVA is delighted to take part in the re-birth of the UK nuclear new build industry. Our EPR TM reactor is on the point of gaining regulatory approval in the UK with all regulatory issues resolved. We are committed to making as much use as possible of the UK’s excellent engineering skills in the construction of the EPRTM reactor and to develop these skills further. We hope that the prospect of a fleet of EPRTM reactors will provide an incentive to UK companies to invest. Work is already under way”. Business Minister, Lord Marland, said: “AREVA’s announcement that it plans to grow its commercial relationship with companies in the UK is good news for the nuclear industry and supply chain. There are important commercial opportunities in the sector which we will work in partnership with industry to develop. “Only last week we published the nuclear supply chain action plan which outlines how we can ensure that we are competitive and ready to deliver. The Nuclear Advanced Manufacturing Research Centre stands ready to work with potential suppliers. And we will be publishing our overarching nuclear industry strategy next year”. Humphrey Cadoux-Hudson, Managing Director of New Build at EDF Energy said “In identifying these 50 UK companies as having the potential to help us deliver the reactors for our proposed new nuclear power station at Hinkley Point C, AREVA has demonstrated the scale of the economic benefits which our project can bring to the UK. We remain committed to helping UK suppliers make the most of the opportunities presented by the project, which will deliver safe, reliable and affordable low carbon electricity for the UK, subject to our final decision to invest”. AREVA supplies solutions for power generation with less carbon. Its expertise and unwavering insistence on safety, security, transparency and ethics are setting the standard, and its responsible development is anchored in a process of continuous improvement. Ranked first in the global nuclear power industry, AREVA’s unique integrated offering to utilities covers every stage of the fuel cycle, nuclear reactor design and construction, and related services. The group is also expanding in renewable energies – wind, solar, bioenergies, hydrogen and storage – to be one of the top three in this sector worldwide in 2012.